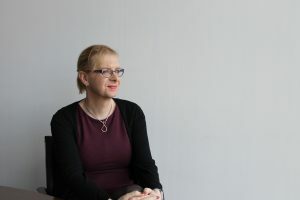 The Gender Recognition Act (2015) gave trans people in the Republic of Ireland a way to get full legal recognition of their preferred gender but awareness of transgender issues remains low. ‘People generally want to help,’ Gordon Grehan from Transgender Equality Network Ireland (TENI), says, ‘but faced with a trans person they are often afraid of saying the wrong thing and offending them and that makes communication difficult. ‘I grew up in a place called Glengormley, just north of Belfast,’ says Kirsty, a transgender woman who works in Bank of Ireland (Northern Ireland). ‘I was quite geeky. Even growing up as a teenager in the 80s, I liked computers and things like that. Kirsty was aware that if she showed any inclination to dress up like the girls she would be bullied so she kept her feelings to herself. She used to secretly add an ‘a’ to the end of her old male first name – Kirsty was assigned male at birth – changing it into a female name. ‘I used to do it in pencil then rub the ‘a’ out,’ she says. ‘I was dressing up in Mum’s clothes when I was a teenager but that stopped when I went to university. This was the days before the internet so you couldn’t shop online. I don’t know where her comment came from but it obviously made a massive impression on me. I said, ‘well, actually, that does have its appeal’. With her permission, I bought a few things online from a catalogue and had them sent to our home address and I would dress up a little bit in the evenings. ‘I thought, ‘I can’t do that now I am a Dad’,’ she says. She searched online for ‘transgender support’ and found a support group in Belfast. ‘I went there and they had changing facilities so I could go along in my male clothes, go into this wee room, and transform myself. May 2014, was the first time Kirsty went out in public – ‘presenting female’ in the terminology. ‘Essentially,’ she says, ‘I was dressed as a woman, wearing make-up and a wig (my hair wasn’t as long then as it is now). She says she knows trans people who have had serious problems but considers that she has been lucky. ‘Over the course of the next 2 or 3 years, I became more and more comfortable going out as my female self. The difficulty was I was married with two kids. But I had to transition because I couldn’t continue living as a man and we had to separate. My ex-wife is a very supportive person and she continues to be supportive of me. We have a very good relationship and even though we are divorced we are still friends. Kirsty and her ex-wife had a conversation with their older daughter first. ‘The first thing we said was, ‘Mum and Dad are going to get divorced’ and we could see our daughter’s bottom lip was going. And my daughter just looked at me and said, ‘that’s okay’. She just said, ‘but you’ll still be the same person’ and she gave me a hug. Kirsty says that she knows that she is very lucky. She has friends, she says, that haven’t had any contact with their children in years either because the children can’t accept their transition or their ex-partner can’t accept it. Kirsty has two siblings in Northern Ireland and two in the Republic of Ireland and came out to them each individually, face to face, over the course of a weekend. ‘They were all great. The interesting thing was what they thought I was going to tell them. One of my brothers and one of my sisters thought I was going to tell them that I was a gay man and I had fallen in love with a man. Which I hadn’t. When I arrived at my other sister’s house, she told me that she had had a dream in which I told her I wanted to wear women’s clothes – that wasn’t a million miles away. 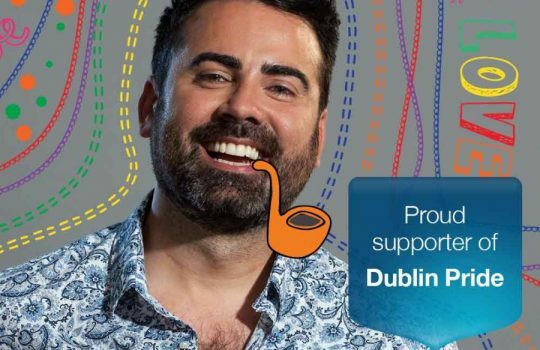 Bank of Ireland now have a policy on Gender Identity and Transitioning in the Workplace but when Kirsty first looked for one, in 2016, it hadn’t been developed yet. Kirsty helped inspire our work on the policy which was launched in 2017 on Transgender Day of Remembrance. ‘That gave me encouragement,’ she says. Kirsty’s line manager, Liz, spoke to Kerry, the HR Business Partner for the UK and a week later the three of them met. ‘They came out for lunch and a cup of tea with me,’ says Kirsty. With the help of SAIL, a support group for transgender families in Northern Ireland, they created a Transition Plan for Kirsty and Transgender NI, ran several transgender awareness sessions for bank staff in Belfast. The letter was sent mentioning that Kirsty had the ‘full support of the Head of Bank of Ireland Northern Ireland’ and all her customers were phoned in advance. 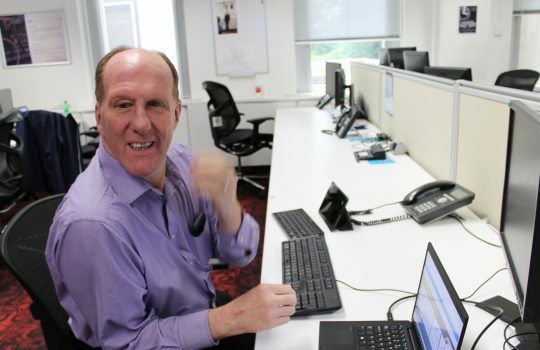 ‘I came back to the office after 3 weeks’ leave in July 2017. I had my new pass with my new photo waiting, I had a new email address in my new name, I had my card for the deli bar, I had my new work iPhone working in my new name, and I had access to our internal systems all in my new name. Without exception, my clients have been great. They have either said to me ‘we’re really pleased and supportive of you’ or they’ve just carried on as if nothing has happened. In some ways, that’s almost better. It’s been a hugely positive experience,’ Kirsty says. ‘I went through 2 to 3 years not knowing of what was going to happen if I came out at work and I think it’s important that people who have these feelings see that a transition at work can be successful,’ says Kirsty. I was 46 when I came out and started living full-time as a woman. ‘As far as changing my bank details is concerned,’ she says. ‘I went into the branch with my deed poll and account details and they changed the name on the account. They ordered me new cards and cheque books. All they needed was ID showing my old name and my new name. ‘We are thankfully reaching a point where being trans has a lot less stigma than it used to,’ says Kirsty. ‘When I was 13, I knew I was trans but I also knew that if I told anybody my life would not be worth living. If I was 13 now that would not be the case. There is no doubt that the numbers of children coming out as trans to friends, teachers and parents is on the increase. But that’s because they can be open now. Bank of Ireland personal customers in Republic of Ireland, please click here to find out more about changing the name on your account. Bank of Ireland UK personal customers, please click here to find out more about changing the name on your account. BeLong To created a video featuring trans people, their parents and teachers giving tips on how to support transgender people. They have also created a video on the experience of being trans ‘What is Transgender’. ‘If you are an adult in Northern Ireland,’ says Kirsty, ‘the people to approach for help are Transgender NI and in the Republic of Ireland the people to approach are TENI. In Northern Ireland, SAIL can give families advice on supporting a trans child while Mermaids in the UK also provide help for families. In the Republic of Ireland, BeLong To provide support and advice for LGBTI+ young people from 14-23 years. SAIL NI is a support organisation for the families of transgender and gender variant people in Northern Ireland. TransgenderNI is the hub of information for transgender, non-binary, questioning and intersex people and those who support them across Northern Ireland. Transgender Equality Network Ireland (TENI) seeks to improve conditions and advance the rights and equality of transgender people and their families in the Republic of Ireland. Gender Identity Research and Education Society (GIRES) is a British charity with the purpose of improving the lives of trans and gender non-confirming people including those who are non-binary and non-gender. Read more of "Unity is our strength, diversity is our wealth"
"Unity is our strength, diversity is our wealth"